R. H. Swaney brings a depolarizing voice to the poetry world with this debut collection. Amongst the topics of mental health, self-love, and social progress, readers will find a soft but powerful voice that uncovers the beauty that exists inside of all of us. 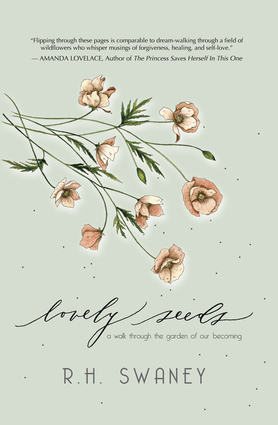 Examining life and its circle from seed to withering to regrowth, the thought-provoking nature of this collection will bring readers to a place of self-exploration, reflection, and a deeper understanding of their place in the world. R. H. Swaney is a writer from Sioux Falls, South Dakota. He was born to a Native American father who abandoned him at birth and a Caucasian mother who struggled with mental illness. Because of these circumstances, he was raised graciously by his grandparents in rural South Dakota. This is where his heart for humanity began to blossom, as he navigated racial differences, small-town living, and a complicated family history. He began writing when he was 12 years old, eventually performing spoken word with various musicians and writing prose poetry. Now, you can find him at his writing desk or favorite coffee shop, writing and contemplating how his art can affect humanity in a positive, life-giving way.